Not to be confused with World 3-6. Area 3-6 is the sixth course of Teatime Twirl and the twenty-fourth course overall in Mario vs. Donkey Kong: Mini-Land Mayhem!. 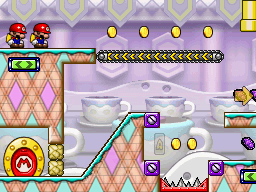 The Mini Marios begin on a platform on the upper level on the left, with the exit door on the bottom left. In order to reach it, the Mini Marios must collect enough Conveyor Pickups to reach the slope leading to the exit. The M-Token is located on the top right, atop a Conveyor next to a Spike Trap. To collect it, the Mini Marios must collect at least five Conveyor Pickups and draw a sloped Purple Conveyor to it. The Mini Mario Card is located on the lower level, to the left of an alcove. The Mini Marios must be led to it by collecting at least three Conveyor Pickups and entering the alcove, following a left-facing Purple Conveyor. In Plus Mode, the Mini Peach must be guided to the exit door first, followed by the Mini Donkey Kong. This page was last edited on September 18, 2018, at 03:59.